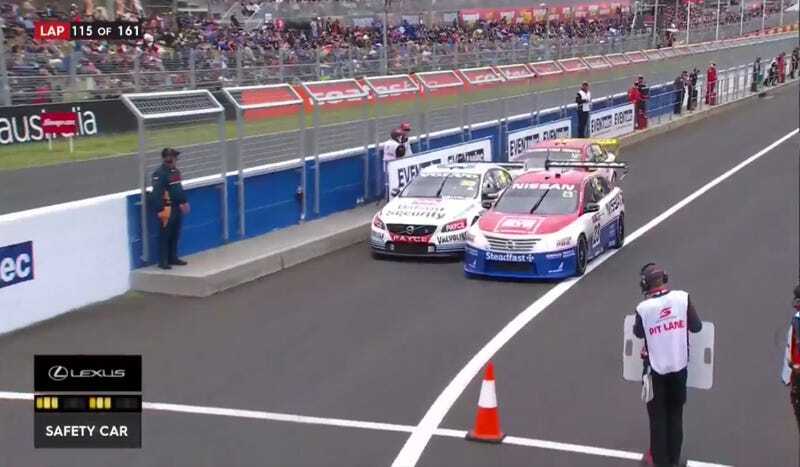 The Bathurst 1000 is one of the most insane races in the world, but you know things are getting really crazy when cars won’t give up their position in pit lane. Watch this hot nonsense between Michael Caruso’s No. 23 Nissan and Scott McLaughlin’s No. 33 Volvo. Neither McLaughlin—who was already in the fast lane out of the pits—not Caruso would yield, with Caruso eventually bumping his way in front at the end of the pit lane. Caruso received a pit lane penalty for an unsafe release. I believe Captain Obvious may have been the steward over that decision.